Al Heighton from Stereohype's B.I.O. (By Invitation Only) Series 10, Darren Firth from B.I.O. Series 5, Totwo, Thom Lambert and Nick Street all three taken from Stereohype's design competition winners, Rinzen taken from B.I.O. Series 2 and Pierre-Paul Pariseau from B.I.O. Series 11. 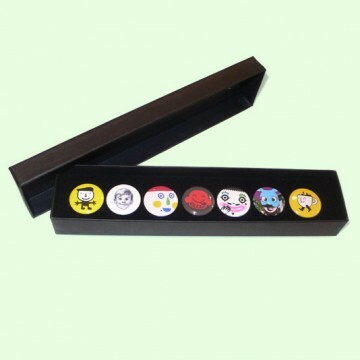 Single badge SKUs: B0567B10, B0237B5, B0506C10, B0095B2, B0520C10, B0655B11, B0510C10.